Change makes people nervous. And it seems to scare some people. Others it just makes mad. But change happens. Sometimes it’s a good thing, sometimes it’s not considered a good thing, but it is inevitable. Nothing stays the same. Someone dies and someone is born. Even that small happening brings immense change. No more can a person walk into Wolf Creek Mini – Mall just to have a little bit of Johnni sunshine into their life. That’s change that hurts. And her family is probably hurting more than I can imagine. To have someone so special that is part of you, is wonderful, but saying goodbye to them has to be much harder than losing someone that isn’t that great. Good – bye, Johnita Gloden. You are already missed more than can be imagined. But change happens. Each of us needs to act a little nicer, a little less judgemental, and smile a little more just to make up for the absence of Johnni. Our Pioneer Day Parade is also beloved. And there’s change happening with it, too, this year. First, it will start at 9:30 am, an hour earlier. Deal with it. It is still going to be wonderful. Second, there is a fee to enter of $20. That’s so there can be awards given out. Skip your daily soda this week and the $20 will be there. Third, the parade route is changing. It starts at Northridge Shopping Center on Highway 64 North and travels down Main Street to North Fifth Street (Long and McKinnon, City office, RC Party) and they turn right and go straight on to the Texas County Activity Center. There is a jog cut out, much to the relief of some of the drivers. As people have found out about the changes, as is normal, some have been quite irritated and vocal, too. One such person called the Chamber, all up in arms, and ranted a bit. She/He was also confused and incorrect, thinking the parade was going over the railroad tracks and on south. Really? There certainly wasn’t much thought in that rant. Over the railroad tracks? And what would we do when a train comes through? Politely ask it to wait? Shees. But, in all fairness, we all have our moments when we don’t think things through. Certainly is true for me. And think on it, it can be said of the church, too. Some churches are against surrogate mothers. Good thing they didn’t have that rule when Jesus was born. Last Saturday was also a time of change. More than a hundred people came out and helped with the Main Street and City Community Clean – Up. What makes someone come out and help others, cleaning up someone else’s trash? Some came because their coach told them they had too. Some came because they told their teams they were required. Some did because they have advisors and mentors that are trying to teach them the importance of service. Each and every one of them deserves our appreciation and gratitude. And if you were home sitting on your tush, you need to ponder the thought of why these youngsters (by far the majority) were there, pitching in and smiling and making a difference and you weren’t. If each of us receives in accordance to what we give, those youngsters are going to be cashing in while some of us are still playing couch potato. It is what it is. The Rotary motto is “Service Above Self.” My selfish self tries to remember this often and I aspire to get better at it. We all should. Signing off, I wish to send blessings to all those who helped with the Community Clean – Up. And while doing so, to also ask for peace for the family of Johnita Gloden who was one of our county’s greatest helpers. May we all receive some of the blessings like Johnni gave. 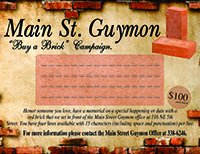 See you on the bricks!